Can typing with 2 fingers be as fast as with 10? There are plenty of people who can type quickly using just two fingers. Like with any skill, typing with two fingers takes practice, and with more practice speed and accuracy will improve. So why bother learning to touch type with all ten fingers if you can do fine with just two? Hopping from one key to the next with the same finger is almost like trying to pedal a bike with one leg. Sure you could learn to hop back and forth pretty quickly, but you’ll never be as fast as if you were using your left foot for the left pedal and your right foot on the right pedal. Like with a bicycle, each key on the keyboard has a finger that is responsible for it. This is designed so that your fingers move as little as possible. Thus, if you keep your fingers on the home row and just move the necessary finger, you’re guaranteed to type faster than if you’re moving your whole hands around the keyboard. The average typing speed when using only 2 fingers is 27 WPM when copying and 37 WPM when typing from memory. The average typing speed for someone using all ten fingers is between 40 and 60 WPM. While this might not seem like a huge difference on a minute by minute basis, the extra time it takes to only use 2 fingers certainly adds up. For example, if you write 10 emails a day for work, it might take you around 2 hours to write these emails using just two fingers at a rate of 27 WPM. 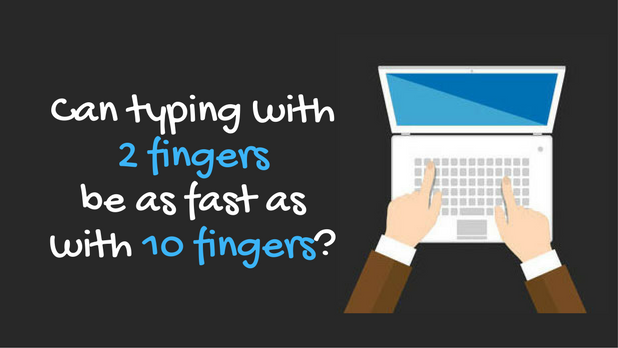 It would take closer to 1 hour to write the same exact emails if you were touch typing at a speed of 50 WPM. That adds up to a full hour of extra time every day! And looking beyond just the average typing speed, exceptionally fast hunt and peck typists can reach up to 70 WPM while the fastest touch typists can break 100 WPM. This means that as you get faster, the speed disparity between 2 finger typing and touch typing only grows. In addition to being slower, hunt and peck typing also tends to be less accurate. Since you need to be looking at the keys much more when typing with 2 fingers, you are less likely to catch mistakes as you make them, meaning it will take you more time to go back and proofread work once you’ve finished. Touch typists, on the other hand, can do this all at the same time, reading as they type and correcting as they go along. There is no doubt about it, touch typing is a much better bet than the hunt and peck alternative, and it’s worth investing the time and effort that it takes to learn to type with all ten fingers. And it’s never too early or late to get started! The lessons here at Typing.com will walk you through the basics to train you to start using all 10 of your fingers. Get started now, and you’ll be well on your way to faster typing speeds before you know it. I type using two fingers, and I can hit over 130WPM with high accuracy, and around 100WPM with 100% accuracy. This is completely wrong, seeming as I don’t know any touch typists whom can type faster then me, it’s simply a different style of typing and is not inferior at all. I hit around 90WPM using only my two fingers. This article is really misleading. If anyone can type faster than 65 wpm, go to the site here, video yourself typing with 2 fingers and prove it. The above numbers are absolutely correct. The fastest typist in the WORLD types 170 wpm and it is on YouTube when he does it. Many typing sites do NOT have the correct wpm used within the coding. Instead of using 5 letters including spaces as a letter. Period. This has been the calculation for wpm today and as far back as the first QWERTY typewriter. Again, prove it, record it, place it on YouTube. You are referring to the site they recommended above? Typing.com? Because I keep hitting over 90wpm on that site using two fingers only . In this video I do a 1 minute test on typing.com with solely my index fingers, getting 116WPM with 99% accuracy. I’m sorry for the sideways view, but it was difficult to film this alone with my phone. The most important factor in terms of typing speed is practice. Hard to believe…based on my experience and training as a keyboard instructor (where I was timed in typing business documents with mixed/numeric/symbols text.) What kind of documents are you typing at this speed–reports, tables with statistical data, legal documents, letters? Are you looking at the screen and keyboard simultaneously rather than typing from copy/documents? I completely agree. I can type upwards of 140WPM with a 95 percent accuracy with just two fingers. It seems to be SO much slower with ten, reaching upwards of 30 WPM. I really like to type fast, so I don’t want to change. Logan, as I stated to someone else. You need to check the code because wpm on a lot of websites is incorrect. The correct wpm is five spaces, which include the space. The most anyone has EVERY typed is 170wpm, which you can find easily on YouTube. If you can do this, then prove it using this site because I know the formula in the coding is correct. and video tape it using two fingers, post it – then maybe you will be us touch typist who really can type upwards of 100wpm – which takes years of practice. You cannot type faster than about 35-55 and with 2 fingers. dont know if this counts as using two fingers because i use middle finger on right and then the index on left, but i can get up to about 90-95. Very good for school work. Keyword “seems”; don’t knock it till you try it. First of all you’re wrong I am a pretty competitive person on your nitro type.com website and I type usually an average of 98 wpm and I type with two fingers and my highest was 108 wpm I am known as Walter073 but also as Challinfe073 I’m usually on y’all’s leaderboards but just to make a point in have a 98% accuracy on there so yeah don’t compare us two typing fingers with them ten typing fingers that is so not cool just leave them be! I prove my case. Not nearly as fast as you but still far above the articles claims and on par with the 10 finger average. Yes, exactly. I type with 2 fingers but I recognize the keyboard of course and I type 120 average and my highest was 127 WPM.. That’s not true lol, depends on what’s more comfortable for you and which method you grew up using. Great job Heckled Heck, we’re at the same speed and we use 2 fingers, higher than most of the 10 fingers people around here probably. I do many…. your way causes more stress to you and more errors… its proven I have been teach for 19 years on this! Sorry! I’m only 12 years old, and I only type with two fingers at around 50WPM. This article is very incorrect and misleading. I’ve typed like that my whole life and I am much slower typing with 10 fingers so why change when I’ve come so far? Yes it is – It looks inferior to everyone. I have been teaching over 20 years and your method is proven to be slower and cause more stress, fatigue, mistakes and injury to the body. You are thinking about each letter and looking for it as opposed to someone who types without thinking about it. Proper way uses muscle memory and skill. Someone who hunts and pecks always is less proficient and looks unprofessional. Please do not tell students your way is correct when you have no credentials or professional background or authority to do so. Employers do not want someone who hunts and pecks over the long proven correct method. Kind of inaccurate. My average wpm is around 70-80 with HnP without focusing too much and I don’t look at my keyboard at all. How i can type more than 55 words in one minute??? I type with 2 fingers and I my average typing speed on nitro type is 68 wpm, while my best is 78. Reaching past 70 wpm is not a task for me, and I don’t need to look at the keyboard either. But is it necessary to use all 10 fingers? Specifically the pinky finger is what annoys me. It is really hard to type with your hands staying on the home row. I use all ten of my fingers, but I bounce around the keyboard. It’s easier for me. Hunt and peck is so hard for me to just get things done. I’m just 11 years old, but with this kind I go to 50 wpm. I am the best in my class at 80 WPM in sixth grade and I only use two fingers. I type the fastest in my 30 person class in sixth grade with 80 WPM. I do it with two fingers. I laugh at all the 2 finger typers getting upset on here. It’s simply physics… the travel time using 2 fingers to type a mixed paragraph will be far longer than for someone typing with 10 fingers. For all the keyboard warriors on here who claim to type 80+ WPM. That is most likely because you practiced that test and that is your highest score. This doesn’t mean that’s your typing speed. Try and take a fresh test and see what your score is. Even if you do type 80+ WPM with 2 fingers, you would be FAR faster with using 10. You’re only limiting and hurting yourselves. Most of us peckers can’t help it, we were raised using two fingers to type. I myself can type around 90 – 110 with a 90 – 100% accuracy on a fresh test, and if practiced can go up to 120 – 140 wpm with a 96 – 100% accuracy. Sure, you might be faster when using the normal style, but if you started off pecking, it really isn’t worth the trouble. I get around 50-60 WMP using two fingers. I used to type with all 10 and typed at about the same rate but it was uncomfortable for me and made my wrists hurt. 2 finger typing doesn’t hurt my wrists at all. As an engineer, speed is the last thing on my mind when writing emails or drawing notes. The bottleneck for me isn’t WPM, but rereading the content repeatedly to make sure that its technically accurate, doesn’t create unnecessary legal liability, and more than anything that the wording is clear and concise such that someone who isn’t familiar with the subject has a reasonable opportunity to understand what I’m saying. I was told in school that I could not survive as a professional if I didn’t conform to the 10 finger system. Total nonsense which could have made me more vulnerable to carpal tunnel syndrome or caused me to abandon my career aspirations unnecessarily. Always draw your own conclusions. I don’t find this misleading, but I definitely say that some of this might need to be worked on. There are some people who are able to type very fast (230 WPM), which is actually possible and there’s a world record for it. But, two finger typists aren’t that slow at typing. Take me for example, I love typing with two fingers, I never look at the keyboard, and I nearly type 100% accuracy without even trying as much. I type regularly around 96 WPM, and on some occasions when I actually know what I am working on, knowing what i need to type, I can nearly type over 140 WPM. Trust me, there are people on this world who cant type faster than some 2 finger typists, and that is fine. I see that I should be able to go 10 finger typing, and get EVEN faster, limiting my speed, but I feel VERY uncomfortable with 10 finger typing, and I already type fast enough. I’m not trying to say to change all of the information, but just know that they’re people (like me and some people in this thread) that can type EXTREMELY fast with only 2 fingers. By using all digits, you’ll be more efficient, have more keyboard coverage and won’t go all over the place. That’s entirely irrelevant if he’s already much faster than most touchtypists with just two fingers. Hi there, I’m a competitive gamer who hits around the top 1 percent in leaderboards for quite a few major games. I really don’t focus much on typing and I hit 85 words with 98 percent on that stupid typingtest.com you mentioned without even trying much. I can even record it for you guys if you want. I usually use 2, 3 and sometimes 1 finger just randomly depending on my mood. Of course typing with 10 fingers is faster but whats the point when you already type fast. Also being in the top 1 percent of games I can tell you that people with 2 fingers can definitely hit 90+ words, it’s just half of the population probably cannot do it and you probably can’t too and thats why you find it unimaginable that someone can type that fast with two fingers. People like this exist in video games too where they think the players in the top 1 percent are cheating just because they are better than them. Anyway this was fun writing and I hope it gives your more insight into how people can type fast with only two fingers. I am a 12-year-old hunt and pecker, and I type an average of 80 Wpm, and my twin who also hunts and pecks types 93. I think this article is very misleading. But even if we restrict it to just two fingers, which is how we started off, having memorized the layout of the keyboard…. my god pushing space with anything other than my thumb is difficult…… I can see why a 10finger typist has a hard time believing 2 finger speeds with this habitual handicap! Find a middle/high schooler who just learned how to not look at the keyboard using the two finger peck method. they will give a much better representation, of actual two finger performance. It’s not slow if your use to it I sware. That said, I have evolved into a 10 finger typist. I still primarily use my index fingers though. My hands constantly move to each side of the keyboard, depending on what I am typing. my index finger is the most used, but I will use my middle and ring finger 50% of the time (50% index, 35% middle, 15% ring). Thumb and pinky dedicated to space and shift/enter. While this isn’t 2 fingers anymore, it is the evolved version of hunt and peck, after hunting is no longer required, and pecking has been improved. My hands don’t have a particular resting position, but instead move straight to the next keys they need to type. When not typing, they can be anywhere. That said, when typing passwords, I use all 10 fingers to type all characters at blazing fast speeds. A combination of the fact I am used to the pattern, and I had to adapt my typing habits to accommodate my 64 character passwords for secure sites (like banks/email). WebAuthn is making that no longer necessary. Can’t wait for the spec to be finalized. return std::math::floor(((max(@a,0) – b) / parser::parse(&c).to_int()^2) + 0.5); # Hope these fn exist, and variables are initialized. Your pinky just gets used to that position. Its morally wrong to use asinine “hunt and peck” methods to type. You have 10 fingers, use them. The defensiveness shown by many of the posters on here proves they know they are doing it wrong and simply don’t want to admit it. It isn’t merely about speed or accuracy but style. 10 fingers is more elegant and looks better. I never recorded how fast I type but it is really fast. I am typing in a chat and i get kicked for spamming but it is really called fast typing. People were thinking I was pasting and I was really just typing fast. When I took AZ Merit my friends thought I cheated but no, typing fast. I use two fingers and when typing with ten, I get less than 30WPM. If you have grown up typing with two fingers, don’t bother using ten. True, ten fingers have been faster than two, but recording the fastest of ten and fastest of two doesn’t show the information people want. This site is just wrong. I am very surprised with the typisters with two fingers saying that they can be faster than to whom can type with 10 fingers, it is really a joke,it is likey to say to someone who has one leg that he/she can run faster thant the one who can run with two legs.